Valentine’s Day is coming up for you to spend the day with that special someone. Whoever it may be, it gives you the chance to dress up and look extra pretty for yourself, and even for your partner. The most important part of the day is being able to pamper yourself, which is also another part of self care. So, here are some quick and simple makeup ideas and products for that perfect Valentine’s Day look. For the face makeup, keeping it simple is the best way to go. Use a lighter foundation to even out uneven skin tone and blemishes. Contouring is optional, but if you would like to bring out the cheekbones, you can use a light contour on the nose bridge and sides of the face. For this makeup look, we will be focusing on the blush to give off this cute, flushed look. Using a pink blush is the best way to match the mood for Valentine’s Day. MEMEBOX’s I’m Heart Stamp Blusher is a fun product to use because it makes cute heart shapes on your cheeks. For the eye makeup, using a pink or coral eyeshadow color is perfect. Use light eye makeup to put more emphasis on the cute blush and lip color. For the eyeliner, just lightly tightline the waterline to make the eyes look bigger. You can even add a short wing at the end of your eye to make the eyes look wider as well. Lightly curl your eyelashes and apply mascara to make the lashes pop. 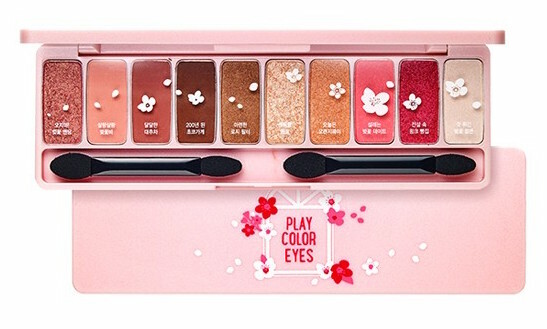 Some cute eyeshadow palettes that have the perfect pink and coral shades are Etude House’s Play Color Eyes in Cherry Blossom and Moonshot’s Honey Coverlet Eyeshadow Palette. For lips, use a pink-red or even a pink-coral lip product to finish off the whole look. Lips always complete the look with the perfect color to match the cute blush and light pink eyeshadow. For a lip color that stays on your lips throughout the day, use a long-lasting lip tint or liquid lipstick. Some lip products that are great for keeping the color on your lips all day are Etude House’s Matte Chic Lip Lacquer and Peripera’s Ink Velvet Lip Tint. Valentine’s Day is coming up soon, so it’s time to get ready and excited for that special day. You get to dress up and pamper yourself with a makeup look fit for this occasion. Pink, red, and coral is the color theme for this makeup look. What are your favorite makeup looks for Valentine’s Day? Let me know in the comments below!